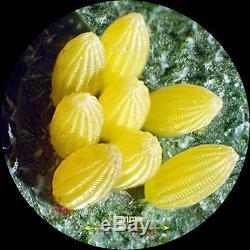 AmScope SM-5BX 3.5X-45X Binocular Stereo Microscope on Ball Bearing Boom Stand. 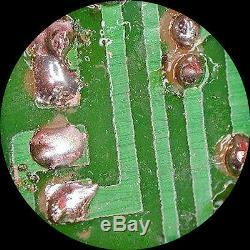 Please note that we cannot honor warranties for other sellers' products! 3.5X-45X zoom microscope on ball-bearing boom stand. Super widefield optics w/ crisp clear stereo images. Ball-bearing stand offering effortless moving adjustments. Very easy to move the microscope forward & back. 2-1/2" (65mm) field view and 8" (200mm) working distance. 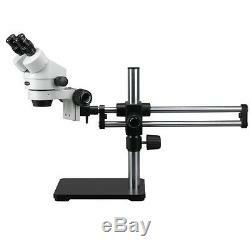 This is a binocular 3.5X-45X zoom stereo microscope on a versatile ball-bearing boom stand, giving crystal clear sharp images. It comes with a binocular head with 30mm super widefield, high-eyepoint WF10X/20 eyepieces and a ball-bearing double-arm boom stand. The ball-bearing design allows you to move the microscope head forward and back so easily that you can have it done by the touch of a finger. 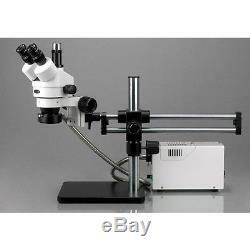 This microscope offers high resolution, super widefield of view, large magnifying zoom range and long working distance. It is an ideal instrument for engravers, gemologists, circuit board inspectors and anyone in semiconductor and/or electronics industry. 3.5X-45X Stereo Zoom Microscope on Ball-Bearing Boom Stand. 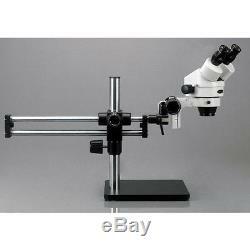 Allows You to Move the Microscope Head Forward and Back at the Touch of One Finger! High Resolution with Great Flatness and Contrast. Erect Stereo Sharp Images over a SUPER Widefield of View. Accurate Alignment Ensuring Fatigue-Free Long Time Viewing. Crystal Clear Original True Color Images. 45 Degree Inclined Binocular Head with SUPER Widefield High-Eyepoint Eyepieces. 30mm WF10X/20 SUPER Widefield Eyepieces (see the difference in the above picture). Both Ocular-Tubes with Adjustable Diopter. 8 (200mm) Large Working Distance. Versatile Boom Stand Covering Large Working Area. Heavy-Duty Cast Steel Stand Finished with Stain Resistant Enamel. Rugged Solid Cast Steel Base. Manufactured under ISO 9001 Quality Control Standard. Unbeatable Low Price Guaranteed or the Difference Back! Head: 45 degree inclined 360 degree swiveling binocular. Eyepieces: 30mm super widefield high-eyepoint WF10X/20. Interpupillary Distance: 2-3/16" - 2-15/16" (55-75mm). Field of View: 2-1/2 (65mm) in diameter. Boom Stand: 28" (710mm) overall length, 16" (406mm) high pillar, 11-1/2" x 10-1/2" x 3/4 (292mm x 267mm x 19mm) solid steel base. One Binocular Stereo Zoom Head. One Pair of Super Widefield High-Eyepoint 10X Eyepieces. One 0.5X Barlow Lens. One Ball-Bearing Double-Arm Boom Stand. Package: 2 (55 lbs +15 lbs). We offer 30 days from the date of receipt (verified by tracking information) to request a return on a unit. We appreciate your patience and understand everyone has a critical need for their unit, and do everything we can to ensure that these requests are handled as quickly as possible. Items damaged in transit are not covered by us. Include your order number, reason for return, and if any pictures are required for your claim, please include them also. Follow the issued instructions, and once received, we will process the item in, and check to ensure everything is there. Processing is done first come, first serve, and can take between 1-4 weeks to process (depending on how many requests we currently have in queue). We thank you for your patience while we work on your request. 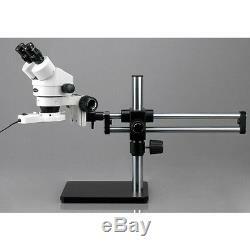 The item "AmScope SM-5BX 3.5X-45X Binocular Stereo Microscope on Ball Bearing Boom Stand" is in sale since Wednesday, March 06, 2013. 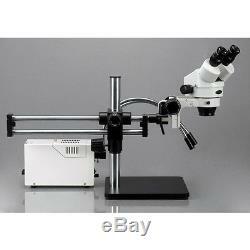 This item is in the category "Business & Industrial\Healthcare, Lab & Life Science\Lab Equipment\Microscopes". 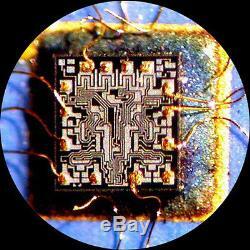 The seller is "precision*world" and is located in Irvine, California.